1954 The following year another reigning British monarch decided to visit Gibraltar. This time it was Queen Elizabeth II who briefly set foot on her colony while on her Coronation Tour as she transferred from her aircraft to the Royal Yacht Britannia. When the Spanish Government heard about the visit it immediately issued a protest and there were anti-British demonstrations in Madrid. 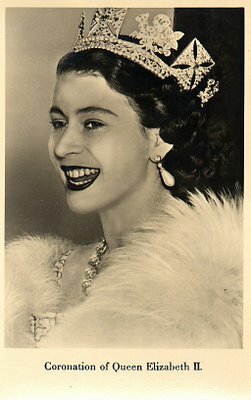 The Spaniards followed up their protest by bluntly stating that they could not guarantee the Queen's safety in Gibraltar. The Queen and the Duke of Edinburgh being taken to Government House from Gibraltar airport after arrival. With his usual acumen Sir Anthony Eden, then Foreign Secretary had not foreseen this reaction and it was left to the Defence Security Officer in Gibraltar to do whatever he thought necessary. Security was immediately and dramatically tightened. Among other more pressing matters, he made sure that the few local eyesores and undesirables were conveniently hidden away for the duration. Among these was Gibraltar's one and only tramp. His name was Tobaila and he was virtually an institution. 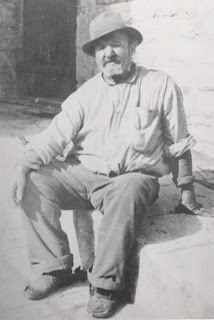 He was the last of those Maltese immigrants that the good Dr. Scandella had referred to in the previous century as 'the scum of that people'. An authentic 'Gentleman of the Road' he lived off Army rubbish bins and was known to servicemen as 'Malaga Joe'. Tobaila. My brother tells me that he thinks his real name was Ruggiero Grech. The caricature was one of a series drawn by Eric Chipulina for an article on street characters of long ago published in the Gibraltar Chronicle. Apparently, in his earlier and fitter days, when the wanderlust took him, he never thought twice about taking a stroll to Malaga. 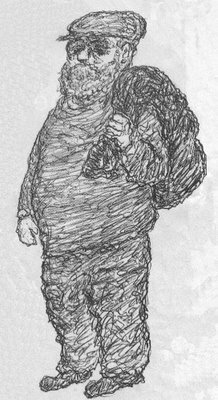 He spent most of his time shuffling about town with a sack slung over his shoulder. It probably contained his bedding as he always slept in any convenient doorway. His presence always left behind an indescribable smell. Prior to the Queen's visit, the authorities had taken to carting him off to hospital every so often for treatment of one type or another and for a general clean up. He was never very enthusiastic about either of these interferences with his normal life, and when he finally emerged from his treatment, looking positively pinkish and invariably done up in a spruce white suit, the effects never lasted very long. In about a month he was back to normal. 'Ninio, ninio, juega cara o cruz? Despite his many years in the area his Spanish was still very rudimentary. Tobaila out of the way, the Rock was ready to receive Her Majesty with open arms. Ironically, Gibraltar had been chosen for the visit as it was supposedly the only port of call where Her Majesty would be welcome on the several thousands of miles of her journey to Kenya. 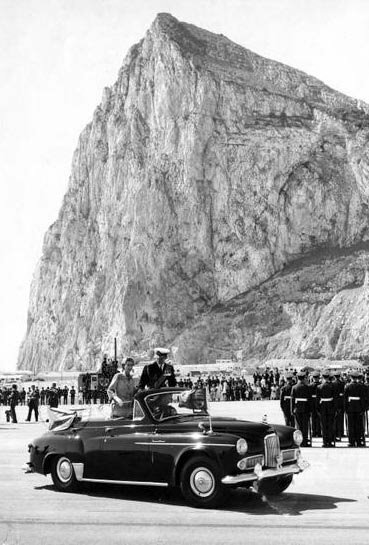 The Gibraltarians gave the Queen a warm welcome and settled back to face the consequences. By pure chance I happened to be one of the crowd when the Royals passed by in an open Rolls on their way to Government house. Later, when I discussed this momentous event with my sister we both agreed that the things that had struck us both most was the peach-like smoothness of their royal skins. 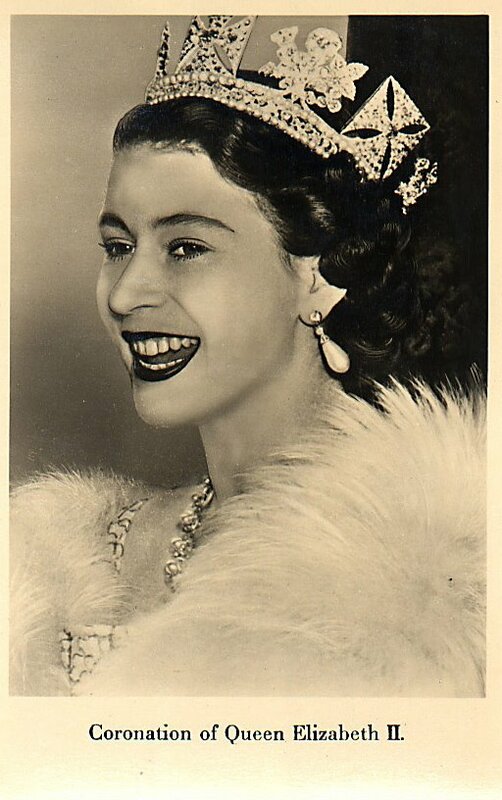 A German postcard of the Queen. 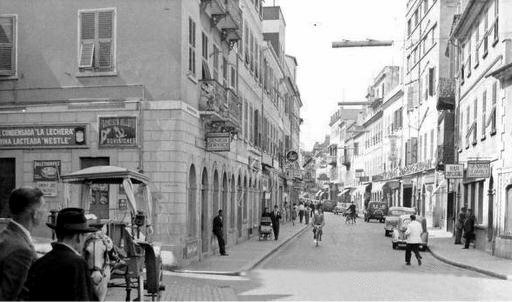 Contemporary photo of Main Street Gibraltar.